After 75 years, the pioneering color film is no more. Now perhaps the art world can recognize its unique worth as a medium. I just got my last rolls of Kodachrome back from the lab. They had sat in my desk drawer for a few years, artifacts of a time when I was taking a lot of pictures and carrying a film camera with me almost everywhere. Kodachrome’s unique color palette—rich, lifelike and slightly vintage-looking—was one of my delights, and though I was a latecomer to the film, for a while I shot as much of it as I could, knowing full well that I was shooting on borrowed time. Even before digital took over, Kodachrome had become a photographic dinosaur. Its multi-stage development process was long and complicated, and the chemicals involved were horribly toxic, an environmental nightmare. Introduced in 1935, for decades it had been the only film that offered accurate color rendition plus archival stability, but in recent years other films, cheaper, cleaner and easier to process, had robbed it of much of its specialness. Much, but not all—the small cadre of professionals and serious amateurs who continued to use it, even stockpiling the stuff in their freezers when Eastman Kodak started phasing it out in 2002 (the last version was discontinued in 2009) swore that none of the competition could render color in quite the same way that Kodachrome did. I wasn’t a stockpiler myself—more of a piler-up who forgets to develop his films—but when I read that all processing of Kodachrome would cease as of December 30, I rushed to make the deadline. I wrapped up the 10 little metal canisters, enclosed a check and mailed the package to Dwayne’s Photo in Parsons, Kansas. For years, only Kodak processed Kodachrome, but in the 1990s the company started contracting the work out to various third-party entities. By 2010 Dwayne’s, a small, half-century-old family business, ended up as literally the last place on earth that would handle it. When Dwayne’s finished processing the last roll (shot by the owner, Dwayne Steinle), it began a very different process: the melancholy task of turning its Kodachrome machines into scrap. When I got my slides back, there wasn’t anything world-beating on them, but viewing them on a light table gave me a strange set of sensations. For one thing, there was that thrill of discovery that comes from seeing pictures you’d completely forgotten you took. There was also the visual pleasure I almost always get from Kodachrome transparencies, pure delight in sensuous hues. And then there was the poignancy of knowing that I had had—and perhaps not made the most of—my last chance to render the world around me in Kodachrome. During its 75-year run, millions of photographers rendered their worlds in Kodachrome, and at first there was nothing self-conscious about their choice and little if any thought given to its special palette. What made Kodachrome special was the fact that it worked, period. It yielded color pictures that looked more or less like real life—a photographic first—and it was easy to use. There had been color processes available before then, notably Autochrome (first offered in 1907), but they were tricky and cumbersome, and no one could argue that their results bore much resemblance to reality. European competitors like Agfacolor and Dufaycolor were also-rans at best. Invented by two classical musicians, Leopold Godowsky and Leopold Mannes (“God and Man” to their friends and associates) who were also contract chemists for Kodak, Kodachrome debuted in 1935 as a motion-picture film and came out the next year in a version compatible with the Leica and other 35mm still cameras (then called “miniatures” or “minicams”). Other formats and versions followed. The most enthusiastic users were dedicated amateurs who documented their family lives and travels and sometimes expressed personal artistic visions. Photojournalists and other professionals were intrigued, but while many of them did use the film, the inability at the time to properly translate its colors to the printed page severely limited Kodachrome’s usefulness to magazine publishers and the advertising industry. As an example, the Magnum photographer Inge Morath took many Kodachrome images while on reporting trips around the world from 1949 to 1960, but very few of them were published. The rest were rarely exhibited, and much of Morath’s color work got lost in her vast archives, only to be rediscovered recently and reproduced in the new book Inge Morath: First Color, edited by John P. Jacob (Magnum/Steidl, $49.95). As for the art world, coming off a century of black and white aesthetics, it tended to reject color photography on principle. Although the picture started to change in the 1950s, it was only after William Eggleston got a one-man show at the Museum of Modern Art in 1976 that color photography was finally embraced by the art-critical establishment. Today, one of the joys of early high-grade color photography—and that nearly always means Kodachrome—is its “you-are-there” quality, the way it almost shockingly reminds us that the world of the 1930s through ’50s was no more monochromatic than our own. Perhaps it was less so—consider the pictures from all across the U.S. taken by the documentary team of the Farm Security Administration during the Depression and World War II. The painted or enamel signs, the motor vehicles, the clothes, have a bursting vibrancy that seems lacking in today’s landscape. Intellectually, we know the world wasn’t black and white or sepia in the 1940s; viscerally, though, at least for those of us who weren’t born then, it only hits home when we look at old Kodachromes. The reason we can have this time-machine experience is that unlike other older color films, both slide and print, Kodachrome didn’t color-shift or fade. A slide made 70 years ago generally looks just as fresh as it did the day it was processed, not magenta or sickly yellow. Anyone lucky enough to have a collection of family pictures taken by a relative who was a competent photographer and favored Kodachrome will know what I mean; for the rest, ample evidence is available on the Web, where huge numbers of Kodachrome transparencies have been scanned and uploaded. 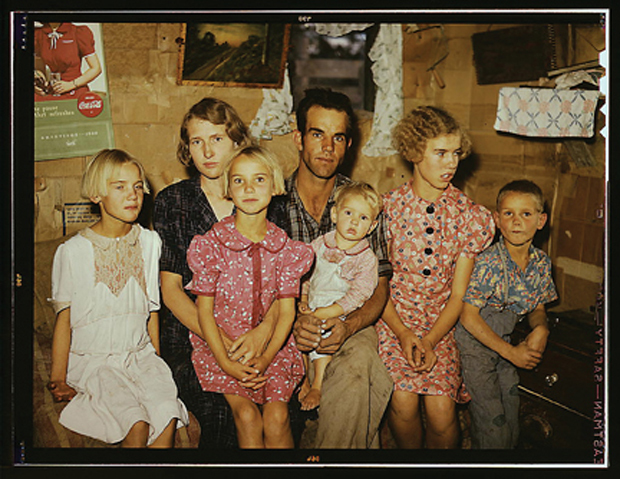 The Library of Congress has put thousands of FSA color images online, by such great documentary photographers as Dorothea Lange, Jack Delano, John Vachon, Arthur Rothstein, Russell Lee and Marion Post Wolcott. The Beinecke Library at Yale has a gigantic online archive of the excellent Kodachrome portraits and street scenes of Carl Van Vechten, a novelist and arts writer who was a major promoter of the Harlem Renaissance. The University of Indiana came into possession of a very large archive of Kodachrome slides made by Charles Weever Cushman, a corporate executive from San Francisco who photographed prolifically with Kodachrome while traveling for business and pleasure, between around 1938 and 1968. This extremely talented amateur, while largely unaware of the contemporary art-photography world, knew his way around a camera and had a killer eye for composition and the telling detail. The best of his images, though intended for no other purpose than his own enjoyment, could be shown alongside the work of major street photographers such as Henri Cartier-Bresson, Walker Evans and Helen Levitt. The whole Cushman archive—outtakes, missed shots and all—can be seen on the university’s website. Browsing through these archives, I realized that the Internet has given Kodachrome a second life. In the past, slides were viewed by projecting them on the wall or through a hand-held magnifier, because a transparency needs to be seen by transmitted light to be appreciated. A printed rendition on paper, seen by reflected light, is robbed of its characteristic luminosity, but high-resolution scans of Kodachromes on a computer screen preserve much of the vitality of the originals. And what about Kodachrome as a medium for fine art? Walker Evans famously said, “Color photography is vulgar,” a discussion-stopper if ever there was. His friend Cartier-Bresson had a more interesting objection: To get composition and timing right is so hard that adding another dimension, color, makes it nearly impossible to triangulate a good picture. What if you’ve got everything lined up perfectly, only to find that the colors clash? Plenty of wonderful photographers, perhaps less fastidious than Cartier-Bresson, have gotten around this objection by being unaware that it exists—or else they decided to revel in the unexpected juxtapositions of color that life supplies on a daily basis, instead of letting the chromatic chaos bother them. Their results speak for themselves. Eventually, art-minded photographers who were not involved with documentary got interested in color work. A case in point is Saul Leiter (born 1923), who started out as a painter and made his living in fashion photography. In the early ’50s, he started doing personal work, street photography, with a 35mm camera and Kodachrome. New York dealer Howard Greenberg, who has championed Leiter’s work, told me, “Almost all the New York City photographers at that time shot color, but they didn’t explore it as thoroughly as Leiter. Saul was a different case; with color he really came into his own. He was comfortable in the world of color in a way that none of the others were.” Leiter’s Kodachrome images treat the colors found in the urban scene as abstract graphic elements. The color isn’t incidental; it’s the true subject of the photographs. The first gallery exhibitions of this material, according to Greenberg, were slide shows. The dye-transfer process—the only really convincing way to make prints from Kodachrome slides—which has been used in more recent times by Eggleston, Stephen Shore and others, was too expensive to be an option for Leiter and other poor photographers in those days. Like Leiter, William Christenberry (born 1936) is a painter as well as a photographer (and also a sculptor). Since the early 1960s he has been taking pictures in Alabama, where he was born but no longer lives, and is best known for doing so with large-format cameras and Brownie cameras. He has also been shooting 35mm Kodachrome all along, and Aperture has just published a book of this work ($65). Christenberry is from Hale County, Ala., where Evans took the pictures for Let Us Now Praise Famous Men, and he admires Evans’ work a lot. In fact, his color studies of ramshackle barns, barbeque joints and signage, usually viewed from the front, are as perfectly devoid of vulgarity as Evans’ similar work in black and white. I met the courtly Christenberry recently at Aperture’s book-signing, and he told me that one of the reasons he favored Kodachrome is that it makes the best dye-transfer prints. For Christenberry, a Kodachrome transparency is an intermediate stage in the artistic process. A 35mm slide is a little jewel-like object, quite pleasing and desirable in itself; there’s something magical about the way it comes alive when held up to light. And a Kodachrome slide in particular has a real physical presence; its reverse side has a slight texture, like a shallow relief. But the relative difficulty of viewing slides, the need to backlight and magnify them, may be a barrier to their acceptance by the market. Greenberg thinks the viewing process is too “labor-intensive” for Kodachromes to ever be seriously collected and achieve significant prices. Kaplan is more sanguine. “To look at a slide is an intimate, hands-on experience, similar to looking at a daguerreotype,” she told me. She believes that very quality may come to be part of their allure. Some people are collecting Kodachromes already—as vernacular art or “found photography.” Boxes of slides taken by anonymous amateurs are on offer at flea markets and on eBay at bargain prices, and enterprising enthusiasts are snapping them up. The artist Guy Stricherz put together a major collection of family snapshots for an exhibition and book (first published in 2002) called Americans in Kodachrome 1945–1965 (Twin Palms, $60), in which he celebrates the “folk-art” naiveté of these pictures. I find most of them to be kitschy and poorly executed. However, I feel sure that among the myriad amateur photographers of the Kodachrome era, there are many great talents and even masters out there, waiting to be discovered, whose only naiveté was to be unaware of or uninterested in the photography establishment. When I hit the flea markets, I’ll be looking for the next Cushman.